Heaven. Hell. Limbo. No-one even knows where we're going. Or what's waiting for us when we get there. But the one thing we can say, with absolute certainty, is that there are moments that take us to another place. Moments of Heaven on Earth. And maybe for now, that's all we need to know. Lexie: It's not Little Grey. It's Lexie. And I'm sorry that I broke... that I hurt you. And I'm sorry that you're humiliated. But I'm not going anywhere. I've got a friend who is guarding the door. A good friend. And since no-one is going to be coming in, I'm now going to climb into bed with you and stroke your hair. Because that's what I like to have done for me, when I'm hurt. Cristina: You've got some problems. You've got some big problems. Owen: Yeah. Yeah, I do. Will, you go out with me anyway? I planned the whole evening, last night. A real date. It was a clear night, one of the five Seattle gets all year. I was going to take you to the West Point Lighthouse and we were going to watch the Northern Lights together. I'd like another chance. I want you to give me another chance. It's your call, Dr. Bailey. It's up to you. Am I an executioner? Or am I a surgeon? Derek: If I stop this surgery, it's the same as me sticking this scalpel into his brain. Is that what you want? Miranda: Yes. That's what I want. Miranda: I need you to stop. I need you to put down the scalpel. This man is trying to kill himself and, God forgive me, I need you to let him. Callie (to Owen): Can you do it? Mark: Him? No. He's a meatballer. Callie: He is meticulous and he will keep his mouth shut. Owen: I've done operations like this before. It's not that complicated. Mark: Guys run into this problem on the battlefield, do they? Owen: I don't think you and I should talk about how guys run into this. Owen: We should operate and then you can kill yourself. Permalink: We should operate and then you can kill yourself. Oh God. Owen: Yeah, that's a penile fracture. Mark: Oh, I'm going to kill myself. Permalink: Yeah, that's a penile fracture. Oh, I'm going to kill myself. Meredith: The patient doesn't want that. Miranda: Oh really, he tell you that? William: Yes, don't page him, he's terribly unpleasant. 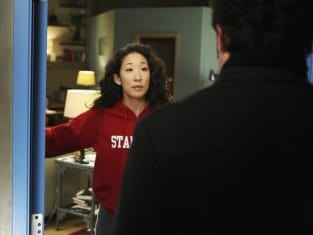 Cristina: It's not, but you don't have to talk about it. Derek: She's in the car, she's in the car and she won't stop crying. Derek: No. She went to William's execution. Meredith: I know you don't understand me. I don't understand me. I wanted to show him compassion. That's why I went. That's the reason. And it was horrible... it was horrible.